Deleting a group of emails in iOS Mail is fairly straight forward, it entails manually selecting each specific email you want to delete, and then relocating them to the Trash. This process of deleting multiple emails is the same on Mail app for iPhone, iPad, and iPod touch. We’ll cover the exact steps to take. 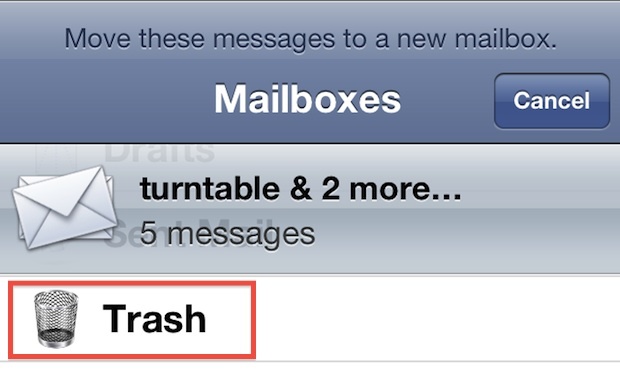 The ability to delete multiple selected emails this way pertains to all versions of iOS, old and new. Essentially what you are doing is selecting groups of emails and then moving them to Trash where they are deleted. As you might have guessed, you can use this same technique to move mail messages from one mail folder to another. Reasonably intuitive and a bit similar to marking multiple emails as “Read” in iOS, though there is some room for improvement in future versions of Mail app. Keep in mind that modern versions of iOS Mail include a separate “Delete All” iOS Mail ability which is much more efficient than manually selecting emails to delete. The method described here is best for deleting groups of emails and not everything. Yeah right tapping 200 mails manually. Thinking of a select button apparently is too much effort for user friendly Apple. Absurd and annoying. This is the dumbest mail erasure method. i deleted all my emails from inboxes and all all of my flagged emails of course very important. i trashed them all completely all. how can i retrieve all of them. i did it this afternoon and im still trying.